Student scissors for cutting face, ears etc. Start the lesson by talking about dogs and show real pictures of the dogs you are going to make. Then have students use the templates you pre-cut out of watercolor paper and trace their dogs’ head, neck and ears if necessary. Then have the students glue down the neck first, then the head and ears last. Then cut the eyes, nose and spots if they have spots. I actually managed to have the students do two different dogs but I also had a parent helper and a small class in an hour and 15 minutes. If you have time have the students glue down pre-cut black construction strips around the border to finish the dogs. 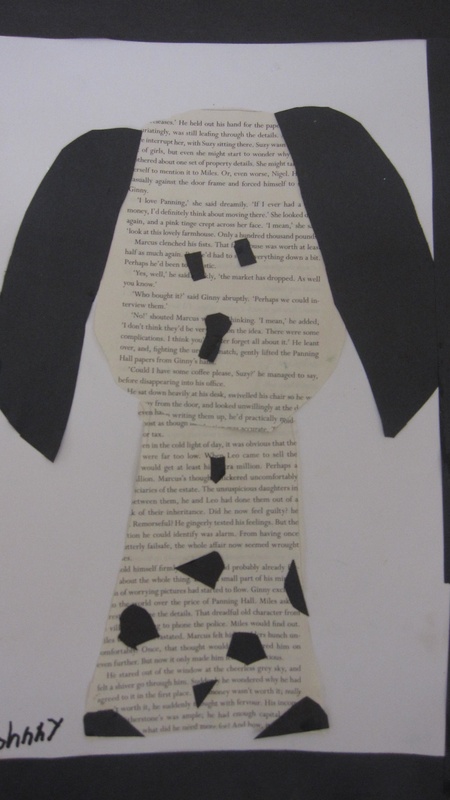 Some students who had black ears used pre-cut book strips for the boarder to add contrast. These just make me smile. I dont remember having these kind of cool art projects in school… The kids are very lucky to have someone that is passionate about art and their learning.